October 1921: he is adopted by the actor Iwai Kumesaburô V, who would like to help reviving the Segawa Kikunojô line of actors (closely related to the Iwai clan). He receives the name of Segawa Sengyo. February 1931: Sengyo plays at the Kotobukiza the role of Otaka's lover Yashichi (in reality Senzaki Yagorô) in the drama "Uekiya"; the role of the koshimoto Otaka, later the mekake Oran-no-Kata, is played by his adoptive father Iwai Kumesaburô V.
Spring 1931 (? ): Segawa Sengyo takes the name of Segawa Kikujirô II (a stage name which has not been held since the 11th lunar month of 1756!). May 1931: founding of the Zenshinza troupe, a left-wing and progressive theater troupe led by Nakamura Kan'emon III, Kawarasaki Chôjûrô IV and Ichikawa Emiya I. Kikujirô is a member of this troupe. November 1933: Segawa Kikujirô II takes the prestigious name of Segawa Kikunojô VI (a stage name which has not been held since the 1st lunar month of 1832!). January 1967: ideological breaking off between Kawarasaki Chôjûrô IV and Nakamura Kan'emon III, the two mainstays of the Zenshinza; the former actor is suddenly expelled from the Zenshinza and the latter actor asks Kikunojô to replace him on the spot in the difficult role of the wicked priest Narukami in the eponymous drama, which is staged in Ôsaka at the Mainichi Hall (8~15 January), in Nagoya at the Misonoza (23~31 January) and in Kyôto at the Minamiza (2~8 February). October 1971: Kikunojô plays at the Minamiza the role of Shunkan in the drama "Heike Nyogo no Shima". 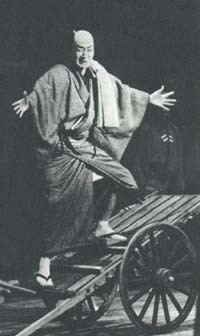 November 1976: Kikunojô appears on stage for the last time, playing the role of Kotetsu in the drama "Shinmon Tatsugorô", which is staged at the Nakaza. He suddenly collapses and dies. Segawa Kikunojô VI was a talented and versatile supporting tachiyaku actor belonging to the first generations of actors who built the famous and dynamic Zenshinza troupe. His best roles were the fishmonger Masagorô ("Shibahama no Kawazaifu"), the villain Senoo Tarô Kaneyasu ("Heike Nyogo no Shima"), Yaichiemon ("Abe Ichizoku"), Hata no Minbu ("Kenuki") and Tatsusaburô ("Ippon Gatana Dohyô Iri"). Segawa Kikunojô VI playing the role of Kotetsu in the drama "Shinmon Tatsugorô"